With more teenagers applying to college today than ever before, the competition has never been stiffer, and the stress can become unbearable not just for teens, but for the entire family. 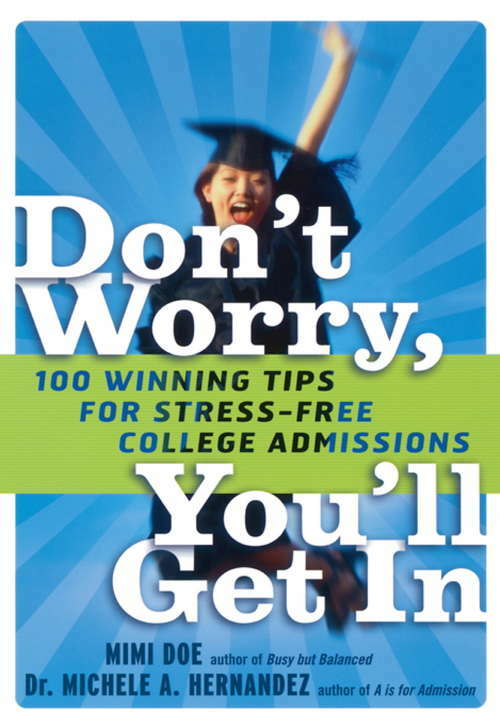 In "DonOCOt Worry, YouOCOll Get In," one of the country's top college admissions counselors Michele Hernandez and leading parenting expert Mimi Doe join forces to bring teens the first college admissions guide of its kind: an easy and accessible book full of 100 specific tips to navigate the admissions process successfully and calmly. For each step, Hernandez explains to teens in simple terms exactly what they need to do, while Mimi Doe empowers them to tackle that step with confidence and in the least stressful way. Covering everything from standardized testing to summer plans to writing a great essay, "DonOCOt Worry, YouOCOll Get In" is the perfect guide for high schoolers who want to be accepted at the school of their choice without burning out for the sake of getting in. "